← Which factors are currently driving technology M&A? This is my first post since taking a break from this blog because of my ongoing attempt to build a merger model of Google and Motorola Holdings and I have been through a few things in general not related to the blog. In this article, I will discuss from my own perspective whether ConAgra Foods Inc. offer of $90 per share for Ralcorp Holdings Inc. benefits both companies or not. Why did ConAgra never gave up buying Ralcorp? Table 1: Comparison of cash offers of $86 and 90 for Ralcorp Holdings Inc. The weighted average cost of capital (WACC) of the combined company is 8.35%, which is higher than the WACC of the $86 cash offer. This is because the market capitalisation of Ralcorp fell from $4563.9m to $3864.94m whereas ConAgra’s has risen from $10635.08m to $11529.07m between the announcements of the $86 and $90 cash offers. This meant that latter firm would have a even larger proportion of the combined firm after the deal has been completed. Also, ConAgra’s WACC has almost doubled from 5.5% to 10% whereas Ralcorp’s fell from 3.5% to 3%. It is obviously clear that the higher offer price worked out better for Ralcorp. The post-deal return is 28.2% compared to 3.2% from the previous offer. However, the post-deal return for ConAgra significantly worse compared that that under the previous offer, which are respectively at 13.9% and 28.2%. The acquirer’s Shareholder Value at Risk (SVAR) has almost tripled from 4.3%, from the previous offer, to 13.5%. This meant that they had to take on more risk to earn smaller returns from the transaction. However, their long-term return could work out better. Did the Ralcorp deal work out well for ConAgra? 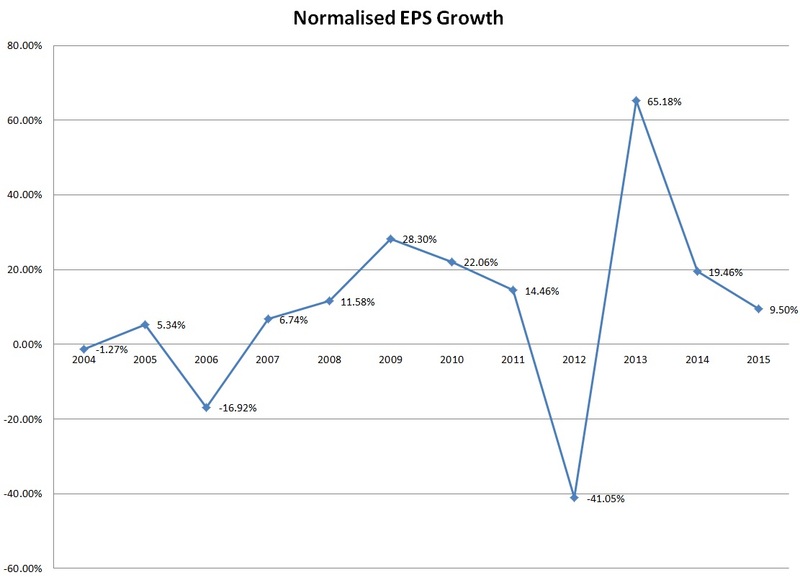 Normalised earnings per share (EPS), that is earnings from the firm’s day-to-day activities, has increased $1.12 in 2012 to $1.85 in 2013. Generally, analysts expect their earnings to go up in the near future at a slower pace going back to it’s long-term average growth of 10.28%.. They managed to raise their dividend conservatively from 96c in 2012 to $1 in 2013. Again, analysts expect that to go up in the near future. However, dividend yield fell from 3.82% to 2.97%. Return on equity and operating margin has gone up respectively from 10.38% and 6.2% in 2012 to 162.% and 9.19% in 2013. Also return of cash invested (ROCI) and cash return on cash invested (CROCI) has improved slightly. Normalised EPS grwoth of ConAgra pre and post deal of Ralcorp. Forecast years are 2014 and 2015 at the time of writing. However, comparing at the company results in 2012 and 2013 the firm had to increase their borrowing pay for the transaction and investment to fully integrate Ralcorp into their corporate structure as well as in new capital which meant return on capital employed (ROCE) fell very slightly, current ratio fell from 1.45 to 1.29 and quick ratio has fallen slightly. They still have enough assets to clear all of their debts in case they go insolvent. Also, they increased their cash flow to such an extent that they can afford to service the increased borrowings. Interest cover is at 5.11 in 2013 compared to 3.99 in the previous year. The rolling price-to-earnings (P/E) of 14.4 is still conservative compared to the firm’s peers in the market and industry. Dividend yield is high compared to it’s peers. However, the firm’s price-to-book value (P/BV) and price-to-cashflow (P/CF) are not attractive compared to market and industry. 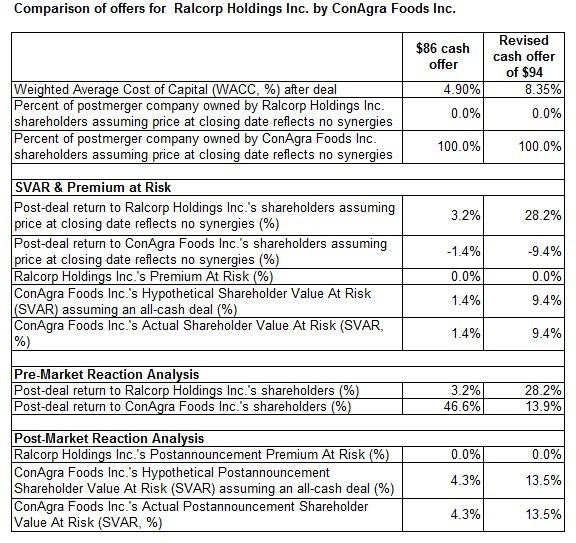 Based on the above analysis, ConAgra has made the correct decision of offering $90 per share in cash for Ralcorp in the short term. The increased risk taking has resulted in an increase in sales, operating profit and almost doubling in post-tax profit. This has in turn led to the firm increased dividend for their shareholders. The firm can also service their increased borrowing for the time being. The share price has only risen by 4.89% to $31.08 at the close of 7/4/2014 from $29.63 on the date of announcement of the deal. (3) This is because, in my opinion, of consumer confidence recovering at a cautious pace in the markets the firm operates in and their fundamentals not that attractive to investors at the moment. Whether ConAgra has made the correct decision or not is up to the jury in the long run. Sharescope retrieved 7-4-2014. Note – Most of the analysis can be obtained easily through Digital Look. Sharescope retrieved 7-4-2014. Note – Most of the company results can be obtained through Digital Look. I'm an Intelligent Investor & a Maths Graduate seeking a back/middle office role within the banking and finance sector. This entry was posted in M&A Analysis, Mergers and Acquisitions and tagged CAG, ConAgra Foods, ConAgra Foods Inc., M&A, M&A Analysis, RAH, Ralcorp Holdings, Ralcorp Holdings Inc., takeover of Ralcorp Holdings by ConAgra Foods, takeover of Ralcorp Holdings Inc. by ConAgra Foods Inc.. Bookmark the permalink. 2 Responses to Has ConAgra Foods made the right choice buying Ralcorp at a higher price?